Leonardo repeatedly studied the forms of rocks in his drawings and paintings. 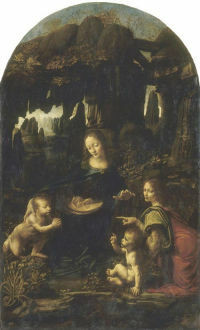 In the Madonna of the Rocks, the dark, secluded grotto in which the holy group are situated lends a profound sense of mystery and wonder to Leonardo’s painting. In the distance, rugged stone formations eroded by natural forces over time rise out of a watery landscape. The atmosphere of the setting is enhanced by the dramatic quality of the lighting, to convey the timeless, unworldly nature of this visionary scene. The rocks might be read in terms of marian symbology, as a metaphor for the Virgin Mary who is described in prayers to the Virgin as a rock “unhewn” by human hands. Also, the cleft rock was regarded as a safe refuge for the infant St. John and Christ during their travels in the wilderness. Drawn by my eager desire, wishing to see the great manifestation of the various strange shapes made by formative nature, I wandered some way among gloomy rocks, coming to the entrance of a great cavern, in front of which I stood for some time, stupified and incomprehending such a thing…Suddenly two things arose in me, fear and desire; fear of the menacing darkness of the cavern; desire to see if there was any marvellous thing within. This painting was commissioned in 1483 by the Milanese Confraternity of the Immaculate Conception for their large sculpted altarpiece in their chapel of San Francesco Grande, Milan. It was one of a series of painted and sculpted components of a large altarpiece, which included two paintings of music-making angels, now in the National Gallery, London, reliefs portraying episodes from the life of Mary, sculptures of prophets and a large wooden sculpture of the Virgin. According to the documents, Leonardo was assisted by the brothers Evangelista and Giovanni da Predis in the execution of the altarpiece. A protracted and complex dispute ensued in 1483 regarding payment, which was not resolved until 1508 with the placement of a second version of this painting, now in the National Gallery, London, in the altarpiece. The execution of a second version of the painting implies that during the years following its completion, the Louvre version must have been either taken, given away or sold. It is possible that it was sold to a third party, possibly Ludovico Sforza.